Malek Jandali, Syrian pianist and founder of the Pianos for Peace charity, poses in front of a colorful piano during the Pianos for Peace festival in Atlanta, Georgia. Dozens of colorful pianos are available for the public to play and enjoy this month in several parks in Atlanta, Georgia, during the second annual festival of Pianos for Peace festival, which runs through Sept. 22. Founded by Syrian-American composer and pianist Malek Jandali, the festival aims to celebrate diversity and help engage people in civil dialogue. "It is a true symphony for peace that celebrates our diversity. When we get to know our neighbors, we realize how much we have in common, and that leads to strength, peace and unity in our communities," Jandali told VOA. The festival is part of the Pianos for Peace charity, which Jandali founded in 2015 with the goal of building peace and harmony through music and education. According to the festival's volunteers — over 1,000 artists, educators, musicians, filmmakers and piano technicians — the community has responded positively to their initiative. Organizers hope to receive similar feedback this year as well. The Pianos for Peace charity collaborates with the Fulton County Arts and Culture Center, the city of Atlanta and the Atlanta public school system, among others, and relies on funds raised by the community. The organization plans to expand its peace-building work to art projects and support different art programs in the city. "It's about beauty, truth and preserving our shared American and human values," Jandali said. Children paint one of the pianos that will be placed in Atlanta, Georgia, during the second annual festival of Pianos for Peace festival, which runs through Sept. 22. The pianos will be donated to schools after the festival ends. The coloring of pianos represents the diversity of the communities in Atlanta. Artists and other members of the community participated in coloring the pianos. "Not only does the instrument itself become a beautiful, unique work of art, it helps to start a conversation, a dialogue that unites people and encourages them to sit at the bench and listen to each other while playing or singing together," Jandali told VOA. The campaign also has its own application that will help locals and visitors see pictures of the colored pianos and learn about the artists. Once the festival ends, all pianos will be donated to schools, community centers, nursing homes, rehab centers and other organizations of underserved communities. The organizers hope to distribute about 100 pianos by the end of the year. "Last year, thousands of Atlantans and visitors were able to enjoy the pianos, and we hear from so many people who say that stumbling across a beautifully painted piano in a park or train station or community center reignited their passion for music, and also encouraged them to become more active in their local communities," Jandali told VOA. Jandali said he advocates for building a better future for children and embraces young talent. He has personal reasons for helping children. "When I was a child in my hometown [in Syria], I did not have access to a piano for lessons, and had to travel several hours every week just to practice with my professor. It broke my heart to see students across metro Atlanta who did not have access to music," Jandali said. 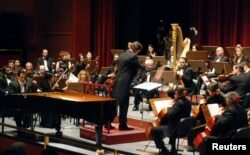 FILE - Syrian-American award-winning classical pianist and composer Malek Jandali, accompanied with an orchestra, plays the piano at the Damascus Opera House, April 1, 2010. Jandali wrote a number of symphonies supporting Syrian children's plea for a better life and future during the past seven years of violence in the country. Syria's civil war has resulted in the deaths of hundreds of thousands of civilians, including children, and has forced millions of others to leave the country. "Everyone deserves to live in peace, and I am blessed to be able to use my music as a platform to share that message around the world. The Syrian children deserve to live in peace rather than rest in peace, and it's my duty to serve and give back to that community as well," Jandali said. Jandali is a well-known musician in Atlanta and in his hometown of Homs. He has produced several symphonies in an attempt to preserve the culture and history of Syria and promote diversity in the country. In 2009, he produced Echoes from Ugarit, the first arrangement of the oldest music notation in the world. The musical notation was inscribed on clay tablets found in Ugarit, a historical site in western Syria.